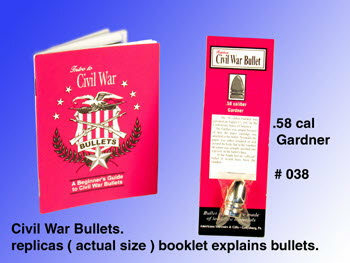 Civil War bullet .58 ( Gardner ) [AMMO-017] - $4.75 : Metalcraft by Blair - military gifts and memoribilia. This is a full size replica of a .58 Cal Gardner bullet as was used in Civil War guns. and they are done in the 1/6 th scale. This product was added to our catalog on Wednesday 20 September, 2006.